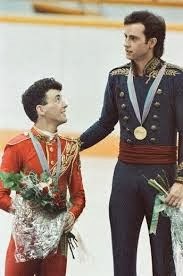 Winter Olympics inspired Awesome Old Song of the Week: "I Can See Clearly Now"
1988: Remember Brian vs Brian? In February of 1988 I was on vacation at Disney World with my family during the Calgary games. One night we were watching bobsledding on TV, and they were having trouble with the track because of the unseasonable spring-like weather. I'm not sure exactly how warm it was, but I do remember that the temperature in Canada that evening was higher than it was in Orlando. Boston went 2-2 in their last four games heading into the break, but the pair of victories came against two of the worst teams in the NBA (Sacramento and Milwaukee). After a bizarre scheduling stretch that had them play 5 of 6 games vs the league's bottom four teams (also Orlando and Philadelphia twice), the road ahead is about to get a lot tougher. The combination of Avery Bradley's mysterious ankle injury that doesn't seem to be getting better (hmm, an excuse to hold him out? ), along with Rajon Rondo being "rested" twice in a three game span this week implies a distinct disinterest in trying to field their best lineup. 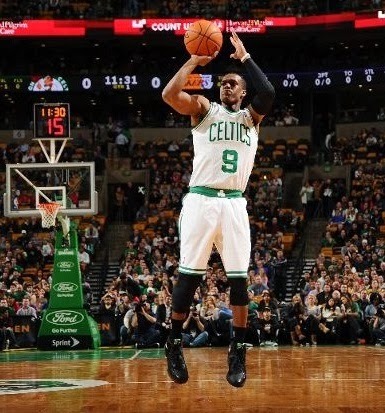 However, the 19-35 Celtics have a lot of work to do if they're going to try to catch division rival Philly in the tank department -- since beating Boston on Jan. 29 the Sixers (15-39) have dropped 8 straight, including back to back losses to the Clippers (in which they trailed at one point 89-33; that's the kind of score you see when the UConn women play Prairie View A&M in a 1 vs 16 NCAA tourney matchup, and even then it's surprising) and Warriors by the scores of 123-78 and 123-80. The trade deadline is also looming next Thursday, and I'd be shocked if Danny Ainge didn't make a move or two that makes the C's worse now, but hopefully better down the road. Any combination of Brandon Bass, Kris Humphries, Jeff Green, and Avery Bradley could end up on their way out the door. 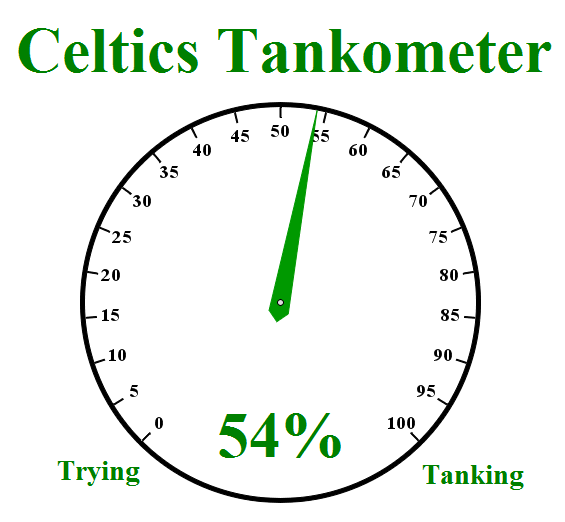 For now the Tankometer stays put at 54%, but I'm expecting to see a sharp uptick in the near future. After 37 seconds of analysis, I'm not sold on "America's Most Exciting Bank"
I'm not really sure what I was expecting exactly; but I have to say that is one of the most boring looking websites I have ever seen. The video on display is the same commercial I mentioned above, which is fairly bland as well. 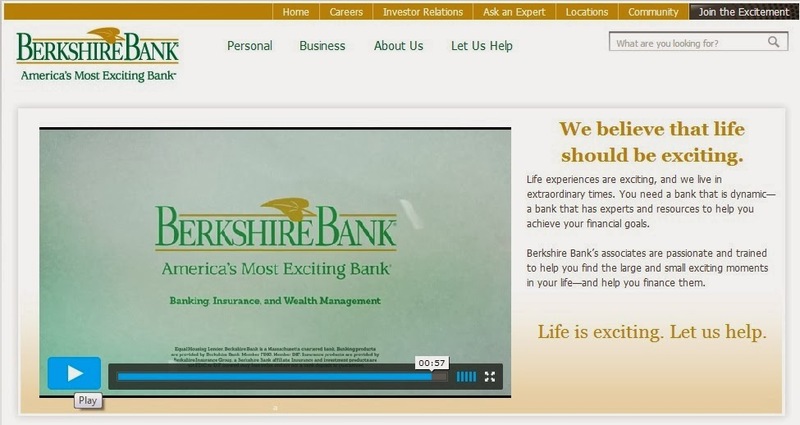 So A+ to Berkshire Bank on their slogan, but a big time fail on the immediate follow up. For all I know their banking methods might be exciting as hell, but their website didn't even entice me enough to find out. Earlier this afternoon a quick glance at my twitter feed prompted me to think to myself "Whoa, Derek Jeter retired!? That is HUGE news." A few seconds later I realized he didn't actually call it quits, he simply announced to the world that he intends to eight months from now. In doing so the next 220 some odd days will now officially become The Derek Jeter Show. Jeter saw Mariano Rivera do the same thing last year, and obviously decided it looked like a lot of fun. Honestly I can't say I would handle this any differently if I were him. But there's no denying it's also a fairly selfish move; a very Brett Favre-esque thing to do. Obviously I'm somewhat biased here. I fully understand that I might not be so adamant in my opinion on this if it wasn't two New York Yankees doing it in back to back seasons. And I also realize that they both rank near the top of the list of all-time Yankees, so these are unusual circumstances. But having said that, I don't care how great a player you are, you're still not bigger than the game itself. No retiring athlete is worthy of an entire years' worth of headlines in every city they go to. Jeter could have easily decided to hang 'em up today (which probably would have made sense considering he's 39 years old and hit .190 in just 17 games last season) and had his shining moment in the spotlight for the next few weeks. I fully understand wanting that moment on the field, so it's perfectly acceptable in my mind to make this announcement towards the end of the year when you're team isn't heading to the playoffs (which Jeter could have done last fall). But hijacking an entire MLB season for your own self-indulgence is just too much. This is going to become more and more of a trend, and who knows how far it will go. Anybody want to bet that when the ego-maniacal LeBron James retires he announces it two years ahead of time? Last night shortly after 12:00 am EST there was curling happening live at the Olympics. I was hoping to watch it on TV, but NBC took it upon themselves not to air it until 3 am. I realize not a lot of people are big curling fans, but I like it. This isn't really about curling anyway, it's about the fact that NBC decides not to show events live. What do they have to lose? At that same time the NBC Sports Channel was airing a rerun of a British soccer show, MSNBC and CSNBC were rerunning news talk shows, on USA there was an episode of NCIS Los Angeles (obviously also a repeat), and regular NBC was televising a rerun of their prime time Olympic coverage from earlier that night (which wasn't even live to begin with). I get it that they want to pack all the stuff they think we want to watch into prime time (which on the west coast is still going till 2 am EST), and that's fine. But how can it hurt to also show things live, particular the things they don't even intend to air in prime time? It infuriates me that they have all these channels they could be using to televise stuff as it happens, and they don't even bother. All the housewives are still going to watch figure skating before they go to bed even if you give people like me an opportunity to watch curling live at 1 am. It seems like a simple formula for NBC to use; air everything live on various cable channels, and then still pack whatever they want between 8 and 11 pm. I don't think anybody will complain about turning on USA late at night and not getting to see an episode of NCIS whatever from 3 years ago. And here's the explanation for why I'm using the above logo for my own personal Sochi Olympics commentary. This blog was originally posted on Monday 2/10. The next time he took the floor (Wednesday, 2/12 against the Spurs) Rondo made 4 of 5 three-pointers, setting a new career high for the second consecutive game. Rajon Rondo has played in a total of 576 games over the course of his eight-year NBA career (including regular season and playoffs). Before last night he'd never made 3 three-pointers in single game. Rondo shot 3-6 from downtown against the Mavericks yesterday. Until two weeks ago (when he went 2-6 on threes vs the Nets Jan. 26) he'd never even attempted 6 three-pointers in one night. Rondo's old high in that category was 5, which he did just once, vs the Hawks back on January 11, 2010. In fact, Rondo had previously only ever attempted as many as 4 three-point shots in a game on five occasions throughout his career. For whatever reason, Rondo is shooting threes at a much higher rate this year since coming back from his ACL surgery. For his career he's hoisted an average of 0.76 attempts over those 576 contests, but this season (nine games played) he's suddenly putting up 2.7 long range shots per outing. To put that in perspective, since 2006 Rondo has had 17 separate streaks of at least 5 games or more where he didn't even try a single three-pointer. Thanks to basketball-reference.com for making this lovely little post possible. The Australian band Real Life originally released "Send Me an Angel" on their 1983 debut album Heartland. 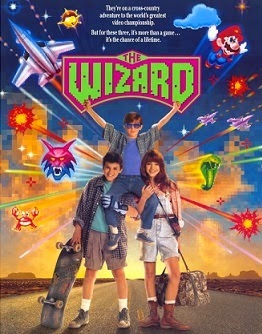 In 1989 the band put out a slightly different version of the single, which was featured in the movie The Wizard. Here's a link to the band's "Send Me an Angel '89" official music video, but I chose to use a clip from the film instead. You take the lead actor (Fred Savage) from the best TV show on the air (The Wonder Years), have him rebel against his parents and hitchhike across the country with a cute girl he meets along the way, then base the entire thing on playing Nintendo (right at the peak of Nintendo's popularity), and you have pretty much the greatest imaginable plot scenario from the eyes of a 12 year old boy in 1989.